The Riviera 36' is an extremely popular and capable vessel and this twin cabin example makes the perfect family home away from home with the benefit of a large swim platform and bait station for fishing with the team. The spacious saloon has a convertible dinette for extra accommodation, the master suite offers a queen sized island berth and the guest cabin features two large bunks. The engine room housing the twin Cummins diesels is clean and tidy and the 6.5Kva Onan generator powers all onboard systems including airconditioning. Well presented and with all of the extras required including a full length cockpit awning with overhead tender cradle and davit for the Aristocraft tender and four stroke outboard. Available for inspection here in Fremantle and highly recommended by our team. Thought about selling your boat? Whether your first or your fifth boat, we are here to make your buying or selling experience an easy and professional one. Bring your vessel to us or sell it from it's home berth. We are a Western Australian BIA member, Club Marine Insurance and Nautilus Insurance agents and pride ourselves on repeat business. Weather you are buying or selling, we are here to assist and look forward to hearing from you. Mezzanine galley with Ceran cooktop and Samsung Convection oven. Master suite with Island Queen berth, convertible dinette and two single bunks. Pioneer Stereo and flat screen TV. Full length cockpit awning with tender cradle. Muir-Cougar anchor winch and electric tender davit. Auto Battery Charger, GME VHF, Garmin 7416 Touch GPS, Ritchie Compass, Seatalk Auto Helm Auto Pilot, Garmin Echo Sounder. 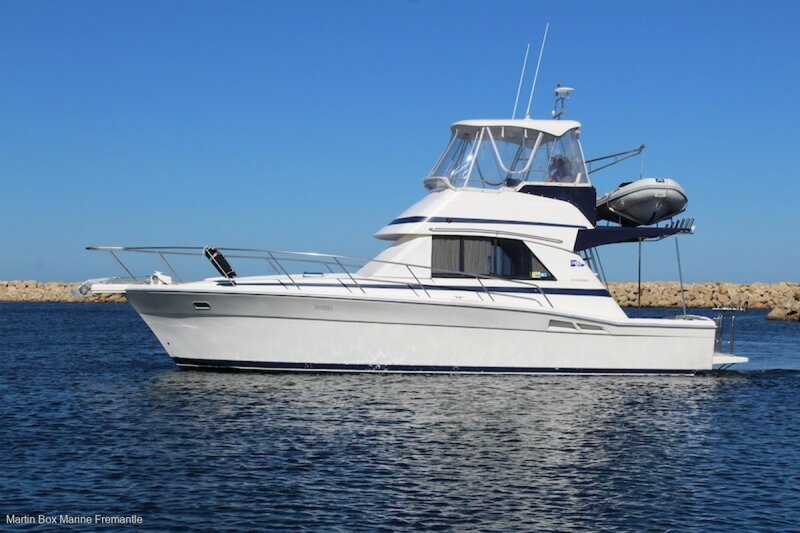 The Riviera 36' is an extremely popular and capable vessel.